A Certificate Is An Endorsement Of Knowledge. At Rahul Computers apart from imparting the best in class knowledge, we help the student scale their knowledge and performance by providing certifications. 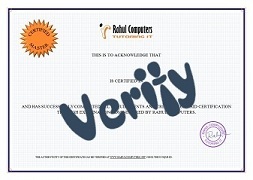 Rahul Computers certification is based on Computerized Adaptive Assessment of the student for all the topics of a subject. We are private certifiers and we test a students abilities for the subject learned from us. Our Certification assures qualification to perform a job or task. Kindly provide the Unique Certificate Id. recorded at bottom right of the certificate.